Fifty years ago today, our patrol was ambushed. The last thing Rudy did was save my life, and he suffered not. I wanted his family to know. I finally found them in 2005 and learned they were notified on Christmas Day. Thank you, and RIP my friend. THANK YOU FOR YOUR SERVICE AS A RIFLEMAN. SEMPER FI. IT HAS BEEN FAR TOO LONG FOR ALL OF YOU TO HAVE BEEN GONE. WE APPRECIATE ALL YOU HAVE DONE, AND YOUR SACRIFICE. WATCH OVER THE U.S.A., IT STILL NEEDS YOUR COURAGE.. GOD BLESS YOU. MAY THE ANGELS BE AT YOUR SIDE. REST IN PEACE. MANY OF US HAVE BEGUN OUR JOURNEY TO EASTER. YOU ARE ALL IN OUR PRAYERS. 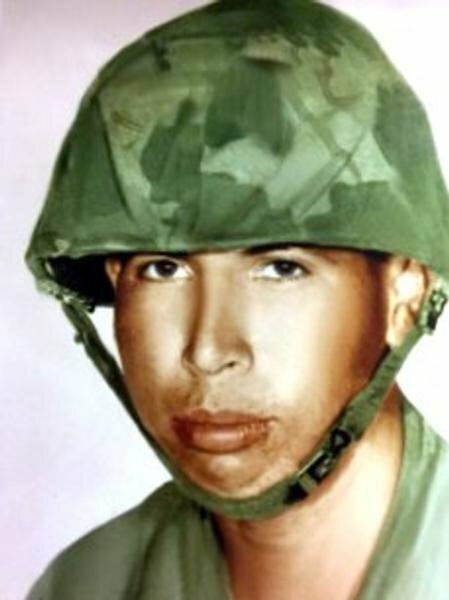 Rudolph, we went tot he Indian School together, we could not go to Public High School, because we are Houma Indians, but you chose to go into the U.S. Marine Corps. You had a clubbed foot but you could out run anyone. This is my husband's uncle. So proud of him. He gave his life to save another solider.